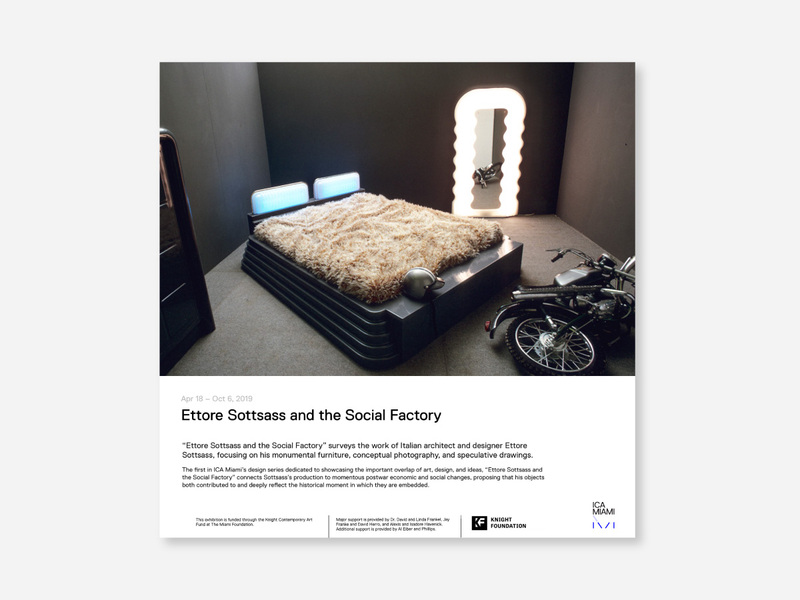 “Ettore Sottsass and the Social Factory” surveys the work of Italian architect and designer Ettore Sottsass, focusing on his monumental furniture, conceptual photography, and speculative drawings. The first in ICA Miami’s design series dedicated to showcasing the important overlap of art, design, and ideas, “Ettore Sottsass and the Social Factory” connects Sottsass’s production to momentous postwar economic and social changes, proposing that his objects both contributed to and deeply reflect the historical moment in which they are embedded. A seminal figure of postwar thinking, Ettore Sottsass (b. 1917, Innsbruck, Austria; d. 2007, Milan) redefined how design impacts modern life. In his approach to manufacture and aesthetics, Sottsass influenced his peers and generations of cultural producers. This exhibition is organized by ICA Miami and curated by Alex Gartenfeld, Artistic Director, and Gean Moreno, Curator of Programs.